Experience the award-winning OneBlox (HDD or SSD) in your own environment, at your own pace with no obligation. Scaling Network Attached Storage (NAS) capacity can be as easy as popping a storage hard drive into the OneBlox appliance. As business requirements for increased data storage or performance change, OneBlox is extremely agile; simply add any number of disk drives, at any time, and in any capacity to meet your needs. Provision only the storage capacity you need, when you need it without complex network storage capacity planning or over-provisioning. Our simple, transparent and all inclusive pricing model with rich datacenter-class features makes OneBlox the most affordable network attached storage (NAS) device in the market. Acquisition costs for both our All-Flash & HDD solutions are 50% to 100% lower than that of comparable network attached storage solutions. OneBlox is an order of magnitude simpler to operate and manage, keeping your operating costs an order of magnitude lower. Storage provisioning is done with zero-configuration. 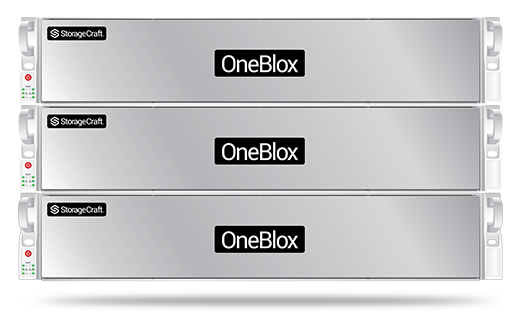 There is no need to manually manage network data storage pools, RAID sets, or volumes with Oneblox. System resiliency from dual disk or even dual network attached storage appliance failure is built-in and automatic. Many of the day-to-day data storage management tasks are handled automatically. All the included features are "on" by default and you never need complex configuration. You can implement disaster recovery with real-time replication in just 4 clicks using OneSystem’s intuitive web interface. OneBlox provides you ultimate in flexibility with the ability to buy your own disks at retail prices then use them accordingly within OneBlox. This way, you will not be locked into 10x premiums for commodity disks. You can mix-and-match any drive types (SAS, SATA) and different capacities within the same appliance with zero-configuration. Drives can be removed and replaced on-the-fly while the file system restores the desired levels of data protection automatically.